There are no prehistoric sculptures, only expressions or manifestations. For example, a 10,000- year- old carving of three human faces and a wild animal can be found in Dong Noi Grotto(Lac Thuy District, Hoa Binh Province). Small ceramic and stone carvings have also been uncovered at archaeological digs in Phung Nguyen, Dong Dau, and Go Mun. The five provinces of Gia Lai, Kon Tum, Dak Lak, Dak Nong and Lam Dong are located in the highlands of south-west Viet Nam where a brilliant culture of Southeast Asian and Polynesian nations lived. The linguistic families of the Mon-Khmer and Malay-Polynesian played the main role in the formation of the language of the Central Highlands, as well as the traditional customs, which have remained very popular among the scattered communities of the region. The association between the two Cham clans of Cau and Dua led to the establishment of a feudal state, which was heavily influenced by Hinduism. The royal kingdom of Champa took shape in what is now South Viet Nam. This ancient country was dispersed along the coastline. Archaeologists believe the kingdom began to develop during the second century, but it was only during the 7th and 8th centuries that the presently-found forms of Cham architecture and sculpture were created; this time period is closely linked to movements of Buddhism and Hinduism. The Chams possessed astounding creative ability and produced magnificent works of art and architecture. The most magnificent remains of the Cham civilisation can be found in Amaravati (Quang Nam Province), Vijaya (Binh Dinh Province), Kanthara (Nha Trang) and Paduranaga (Phan Rang). Sculptures were harmoniously laid together in architectural complexes, which were based on the distinct functions of particular towers. - My Son E1(first half of the 8th century). - Dong Duong (end of the 9th century). - Tra Kieu(end of the 9th century and beginning of the 10th century). - Thap Mam (12th and 13th centuries). - Poklong Gialai (end of the 13th century to the 16th century). Dai Viet became an independent, powerful state after Ly Cong Uan came to the throne and moved the nation’s capital from Hoa Lu to Thang Long (present-day Hanoi). Buddhism became the national religion, and it gradually became a part of everyday life. Buddhist centers formed in Quang Ninh, Ha Nam, Nam Dinh, and,especially in Bac Ninh Province. The Tran Dynasty, which followed the crumbling of the Ly Dynasty, continued the development of Vietnamese feudalism. Victorious resistance against Mongolian invaders in 1258 and 1288 preserved the independence of the country and had a deep influence on literature and arts. At the same time, war ravaged the country, limiting artistic creation. Buddhism continued to be widespread; however, pagodas of this period were not as fantastic as previously constructed pagodas. Numerous lotus form rectangular bases for statues were produced that can presently be found in pagodas in Thay, Boi Khe, and Duong Lieu. 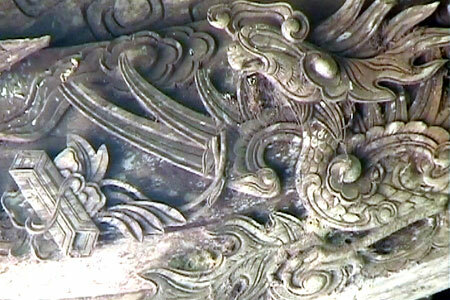 Woodcarvings and engravings with subjects of dancing dragons and fig tree leaves can be found in Pho Minh Pagoda (Nam Dinh Province) and Thai Lac (Hung Yen Province). In the mausoleums of the Tran Dynasty, stone sculptures are mainly of men and animals paying respect to the royal family. The statues of tigers in Tran Thu Do’s mausoleum (one of the founders of the Tran Dynasty) and the statues of buffaloes and dogs in Tran Hien Tong’s mausoleum are the first forms of sculpture in Vietnam’s tombs. Instead, Buddhist sculptures were replaced by magnificent works on the mausoleums and tombs of the Le emperors in Lam Son (Thanh Hoa Province). Following the style of Emperor Le Thai To’s Mausoleum, built in 1433, eight mausoleums for kings and two for queens were built. They had square surfaces with a path in the middle for the gods to run through. Along the sides, there were two rows of statues of mandarins, unicorns, horses and tigers. After 20 years of war with the Chinese Ming occupation (1407–1427), the country was devastated. Numerous products were stolen, temples and pagodas were destroyed, and skilled workers were captured and transferred to China. Emperor Le employed farmers from neighbouring villages to carve statues and to build mausoleums. As a result, the new monarchy saw the production of relatively poor quality sculptures. The Mac Dynasty, which lasted from 1528 to 1598, followed the Le Dynasty. A new style of commercial house sculpture (dinh lang), which was a stark contrast to previous religious and feudal works, developed throughout the countryside. In the 17th century, Nguyen lords came into power and conquered the South. Seven conflicts broke out between the Trinh and Nguyen families during this century. Buddhism was restored and was considered the salvation of the people’s spirits. Over the next 200 years, culture and arts developed and reached high levels of prosperity. Sculptures became more and more diverse and included Buddhist sculptures in village pagodas, sculptures of native religious beliefs in temples, and sculptures for the mausoleums and tombs of the emperors and mandarins of the Le and Trinh dynasties. The statue of the goddess Kuanin with 1,000 eyes and 1,000 arms in the Ha Pagoda (Vinh Phuc Province) is a fine example of the grandiose sculptural work of the 16th century. The Kuanin statue in But Thap Pagoda (in Bac Ninh Province) is symbolic of 17thcentury work. The statue is 3.7m in height, and features 48 large arms and 952 smaller ones, all of which are bunched, together in a dark ring around the eyes. Sculptures featured in commercial houses, such as in Phu Lac, Chu Quyen, Tho Tang, Lien Hiep and Huong Loc, are full of vitality and have liberal features and imposing structures. The identities and styles are a mix of deity and Buddhist images, commercial life, and agriculture. The Nguyen Dynasty saw the transfer of the capital from Hanoi to Hue, and the building of a grandiose imperial city and a complex of mausoleums and tombs. The sculptures of these feudal mausoleums and tombs are considered to be artistically weak and rigid.